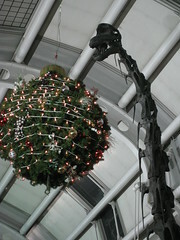 Merry Christmas to all my friends and family from my prehistoric airport friend (who looks suspiciously like he's about to take a bite out of the holiday decorations). So far the weather and I have managed to miss each other (it looks a little dicey there on Wednesday) and I'm having a great Christmas. I hope everyone else is having good time this holiday season and spending time with the people they love and care about. Hope you are having a wonderful and safe holiday, Victor. Best wishes for the New Year.